What rights do I have as a bicyclist in Missouri? Right to Ride on the Road – Some drivers may not like it. They may get impatient, honk their horns, or rudely yell at you to “Use the sidewalk!” Ignore them. Bicyclists have every right to ride on most streets in St. Louis. State law says you should ride as far to the right as is safe. In other words, you may ride in the middle of the lane if that's safer, even if it means slowing down traffic. Right of Way in Designated Lanes – When riding in a designated biking lane, bicyclists have the right of way at all times. This should be common sense, but many drivers think they can cut off a bicyclist as long as they are turning at an intersection. Even in those instances, the driver must yield to any approaching bicyclists. Right to a Missouri Bicycle Accident Lawyer ­– Don't let the insurance agent trick you when you've been injured in a St. Louis bicycling accident. Often they warn victims against hiring a lawyer claiming that a lawyer will take a huge chunk of the compensation. The truth is that you may end up with more money when you hire an experienced St. Louis bike accident lawyer. Still not sure you're ready to hire an attorney? 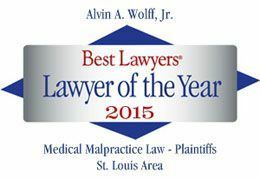 Call 314-241-2500 to set up a free consultation with Wolff & Wolff Trial Lawyers to learn if you do need representation. Be sure to ask for a free copy of his book, The Total Guide for Motorcycle and Bicycle Accident Victims in Missouri.